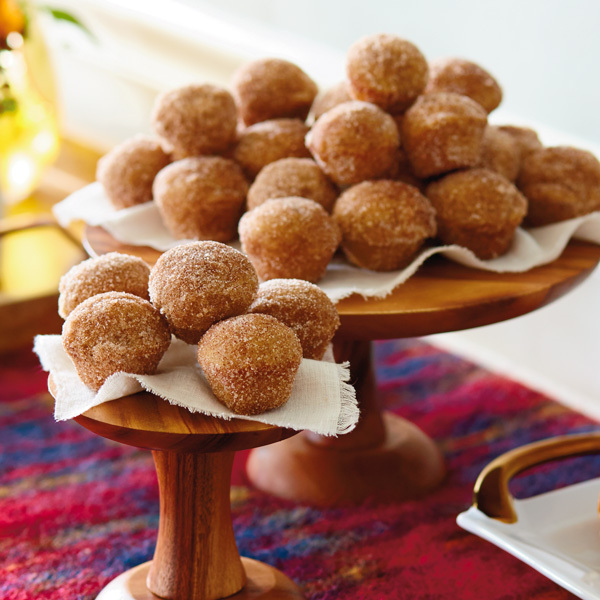 Apple cider donut holes are as lovely as they are tasty. With cinnamon-sugar and apple cider flavor, these moist, bite-sized treats will make you want to pull out a big, woolly sweater and dream of crisp autumn mornings and falling leaves. They’re easy to make and hard to resist. Preheat oven to 325 degrees F. Grease a mini muffin pan and set aside. In a small bowl, beat eggs, apple cider, and melted butter. In a larger bowl, combine the flour, sugars, baking powder, cinnamon, and salt. Pour the wet ingredients into the dry and combine. Do not overmix. Spoon about two teaspoons of batter into each section of the mini muffin tin. Bake for 8-10 minutes, until the tops of donuts are springy when pressed. Let cool for 10 minutes, then turn the donuts out onto a baking rack. Brush each with melted butter and roll in cinnamon sugar to coat.